Fiber Delights® - Vanilla / 60 chew tabs - Nature's Way®. Why take a fiber supplement? Most of us don't get the fiber we need. Fiber Delights® lets you decide when and where to boost your fiber intake. No mixes, no fuss, no mess. Take 1 tablet daily for the first week, then increase to 2 tablets daily. If additional fiber is desired, slowly increase to 8 tablets daily. If pregnant, nursing or taking any medications, consult a healthcare professional before use. 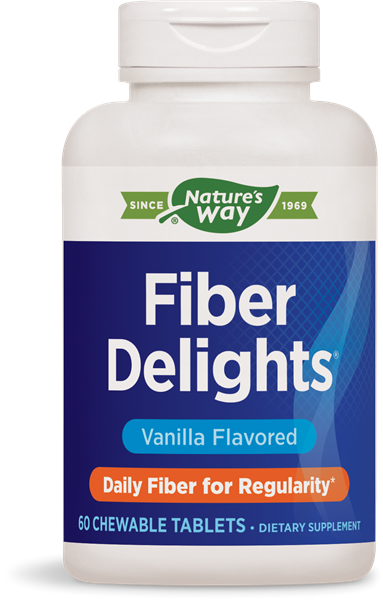 Will Fiber Delights® affect the absorption of prescription medications? Fiber may slow the absorption of some prescription medications. Therefore we recommend that prescription medications not be taken at the same time as any fiber supplement. Generally, waiting at least 2 hours between taking fiber and prescription medications is sufficient, but please discuss the use of dietary supplements with your healthcare practitioner. Chewable sugar free deglycyrrhizinated licorice (DGL) tablet.